TAMPA - R.A. Dickey had to wait until May last season to earn his first win but managed a win in his first appearance this season. 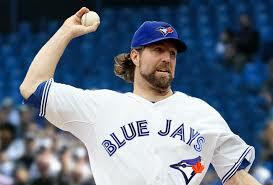 The Jays won 5-3 against the Tampa Bay Rays led by home runs from Michael Saunders, Josh Donaldson and Josh Thole. The Jays are 2-0 to start the season.